A wide-eyed discovery of the world: Corrie Tan reviews Superbolt Theatre’s new play about a group of martians. Mars Actually by Superbolt Theatre, performed as part of Vault Festival 2017. There probably is, seeing as we’re each being greeted in turn by a trio of enthusiastic ‘real-life Martians’. It’s an on-the-nose start that sets the tone for Superbolt Theatre’s Mars Actually, which continues in the group’s DIY aesthetic that brought it indie success and a handful of fringe awards with The Jurassic Parks (2014). “Hello London, the friendliest city in the England!” beams Gracey (Maria Askew), who’s in a sparkly sequinned headband and red leggings. Her fellow Martians from the Mars 84 space base are also oddly outfitted, with Chuck (Frode Gjerløw) sheathed in a jumpsuit, and Conway (Simon Maeder) sporting a Magnum, P.I. moustache and a beanie. They’re standing in front of a hand-painted cardboard backdrop of the solar system, bright and exaggerated, a sort of visual metaphor for the production’s lo-fi kitsch and its characters’ mix of naivete and eagerness. Chuck, Conway and Gracey have grown up in isolation on the Red Planet, eating tasteless nutrition blocks to stay alive and going through an endless array of ‘Level Tests’ to ensure their survival in space. It’s a dreary existence, more so for the women, who are expected to ‘give a child to the community’ once they hit Level Test #9. They’re still adjusting to Earth, so they say, after having been cloistered away for years in a society full of rules and perfect binaries, and a rigid understanding of right and wrong. Their wide-eyed discovery of the world is full of awkward humour – pregnant pauses mined for laughs, cutesy ignorance (“I don’t have your fear of spiders or unattended bags”) and terrible puns (“One moment you’re eating jam, the next moment… you’re jamming”). But the novelty of their whole everything-on-earth-is-so-exciting-and-new approach quickly begins to wear off, and while their observations of the planet and its inhabitants can occasionally be quirky and sweet, their black and white world can’t help but feel two-dimensional – because that’s what they are. 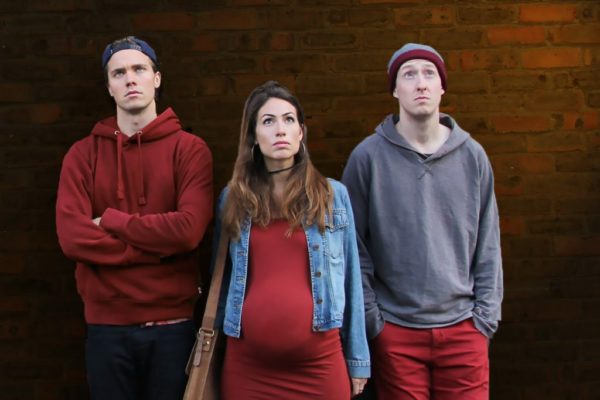 A lot of Superbolt Theatre’s strengths are on show here – their physical dexterity, the smart stretching of low-budget effects, their unflagging energy, the colourful campiness. There’s the occasional flash of excellent object work, including a glorious scene where a clarinet becomes a space shuttle and detaches into several pieces en route to Mars (a soft red ball), passing Sputnik (the clarinet’s tripod stand) along the way. Yet the backbone of the work sags. Most of the performance feels like a scattershot talent show, where the three Martians show off their unexpected gifts through what feel like tacked on segments ‘just because’, including a dance item set to Shakira’s 2001 hit Whenever, Wherever, or another scene where two of the characters demonstrate their uncanny ability to make percussive rhythms with sets of spoons. There are some attempts to fill in a more serious history of the Mars 84 space base and cursory examinations of critical thinking and the intellectual fallout of creating a society that clings to yes-no, right-wrong, multiple-choice solutions to life. Somewhere in here is a parable for a world of ‘post-truth’ and propaganda, including the all too obvious origin story of William White, founder of the space base, who starts out as a sweet child, then learns sexism and misogyny, then keeps telling his staff that ‘you’re fired’ and ‘Mars First’. Sound familiar? But because the play doesn’t interrogate these parallels beyond straight analogies or easy nods to current affairs, and because of an abrupt and very pat twist close to the end, Mars Actually doesn’t travel beyond its obvious, showy humour. Its characters don’t learn from their journey of self discovery – and neither do we. Mars Actually is on until 19th February 2017 at the Vault Festival. Click here for more details.